Marilyn Monroe is a perpetual source of fascination. Just a few years ago, the iconic star was the subject of the Oscar nominated film My Week With Marilyn starring Michelle Williams. Marilyn Character: Not Image, a capsule exhibition at the Mana Contemporary curated by Whoopi Goldberg of the star’s poetry, drawings and the “Happy Birthday Mr. President” Jean Louis dress just closed on October 21, 2016. The show was inspired by Goldberg’s long time fascination with Monroe that began during her years studying with the icon’s acting teacher Lee Strasberg who was the recipient of Monroe’s estate. On November 17, 2016, the “Happy Birthday Mr. President” dress is going to be sold along with a significant amount of the Strasberg Marilyn Monroe memorabilia at Julien’s auction house in Los Angeles. All this recent attention, got me to thinking about one of Marilyn’s most famous jewels—the baguette-cut diamond eternity band she received from baseball star Joe DiMaggio. After dating for two years, DiMaggio proposed spontaneously—in other words without an engagement ring—on January 12, 1954 while the couple was on holiday in San Francisco visiting the Yankee Clipper’s family. Two days later they went to the local City Hall for what was supposed to be a secret civil ceremony with six guests, but it was leaked to the press and 100 photographers, reporters and fans show up. For the occasion, Monroe wore a simple chocolate suit with an ermine collar. DiMaggio was in a dark blue suit and the same tie he had worn on their first date. At the end of the three-minute ceremony conducted by a judge, DiMaggio slipped a wedding ring on Monroe’s finger. 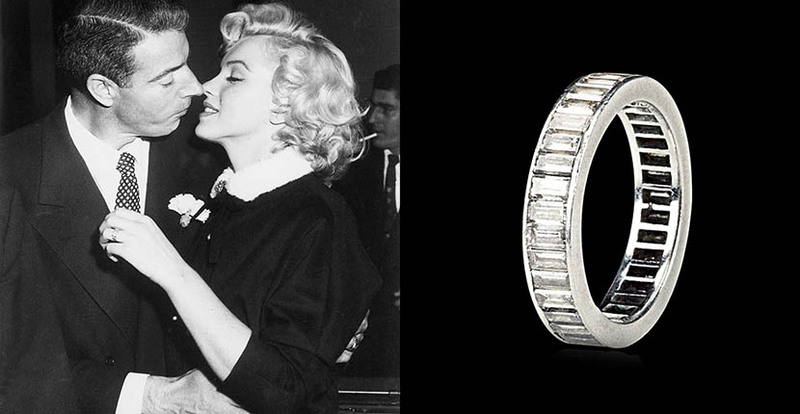 Most celebrity jewelry watchers, including yours truly, have always believed the ring was Monroe’s platinum eternity band set with 36 baguette-cut diamonds. When the ring is laid out side-by-side next to wedding day photos, as it is above, it looks like that is what she is wearing. A closer inspection of the image–and it truly is a challenge to see–reveals that a theory by a website called The Marilyn Monroe Collection about the ring may indeed be correct. It seems to be an antique ring with a cluster of little stones around the top portion. Since the ring has never surfaced publicly their thought is that it might have been a family jewel borrowed for the hasty nuptials. At some point, and no one knows when, where or how, DiMaggio did replaced the vintage style piece with the gorgeous eternity band that can be seen more clearly, if not perfectly, on the Milton Green photo of Marilyn having her makeup done. When the baguette-cut diamond eternity band was sold at Christie’s in New York on October 27, 1999 as part of The Personal Property of Marilyn Monroe sale, it showed up short one baguette but still sold for $772,500. An astonishing figure considering the high estimate was $50,000. While the style of the jewel is a classic, the price clearly reflects the enduring romantic image of two American icons and their short but memorable union—even if it wasn’t Monroe’s only wedding ring.